Representation: Who gets a say in the NHS? The question of who gets a say in how the health service is run was a controversial question from its foundation. Should staff be allowed to help decide the NHS’ priorities? How should patients’ views be treated? What weight should the opinions of local and national government have? What about citizens? In setting up the service the 1945 Labour Government had to consider all these elements and then write them into the structure of the new NHS. Mostly their answers were top-down and excluded popular participation. Once it became clear that the British Medical Association (BMA) was strongly opposed to the health service being controlled by local councils, the government committed to direct the NHS mainly from the Ministry of Health. This was achieved via the division of the country into regions and the appointment of Regional Health Boards (RHBs) to manage services. Instructions and policies were then circulated via the RHBs, who in turn appointed Hospital Management Committees (HMCs) for groups of hospitals. These institutions, alongside Local Health Authorities and teaching hospital groups, were the principal managing bodies for the new NHS. Both HMCs and RHBS were staffed by appointees and it was their expertise in managing public resources or in healthcare matters that was sought, rather than their representativeness. For staff, patients and citizens, that meant largely very indirect control over their health services. For patients, in an era where doctors were not always expected to explain what might be wrong with them (let alone discuss treatment options), the question of having a say in the health service was almost entirely moot. Citizens had had their say in national elections and the government and its policies on health were the result, end of discussion. It was not until the 1960s and 1970s and the rise of health campaign groups like the Patients Association, alongside ideas of the patient as “consumer”, that patient or citizen representation would become a key concern. Historian Alex Mold notes that as concerns about the rights of patients to shape their services became more intense this lead to the establishment of bodies like that Community Health Councils (created in 1974) as what then health minister Keith Jospeh called the “voice of the consumer”. Such voices were usually independent and voluntary, rather than directly representative. CHCs were populated by appointees nominated by central and local government, who for the most part looked to discern citizens’ views on their health services by conducting surveys. For health service employees, like their counterparts in other nationalised industries, there were usually limited means by which to influence the development of their workplaces. Although doctors were a mainstay of RHBs and HMCs, they were never appointed to “represent” the views of their wider profession. Whilst for other health workers, even that indirect influence was absent. Nye Bevan, whose idea of socialism was often quite paternalist and state-driven, was explicit in this regard, dismissing the idea of staff involvement in health service management. Bevan saw no reason why the likes of nurses or porters should have any significant say in how the National Health Service was managed. Despite this, eventually one nursing officer was appointed to each RHB, but on an individual not representative basis. The most direct representation that NHS staff did have was with regard to their direct pay and working conditions, through the NHS’ seven “Whitley Councils”. The Whitley system was conceived after a number of damaging strikes during the First World War. It consisted of joint councils featuring a “staff side” and a “management side”, where agreements were made over pay, conditions of service, training and disciplinary procedures, in the hope of improving industrial relations. In the NHS, these were established in 1948, with one “general” council for all staff, and 9 “functional” councils for different categories of employee, as follows: Nurses and Midwives, Ancillary Staff, Professional and Technical (A), Professional and Technical (B), Administrative and Clerical Staff, Medical, Dental, Optical and Pharmaceutical. The makeup of the staff side of these councils was determined by the Ministry of Health, which allocated slots to trade unions and professional organisations according to how representative they considered them to be of the workforce. Representation could be a confused affair, the nurses and midwives’ council staff side had delegates from 12 organisations. These included 8 professional associations – The Association of Hospital Matrons, The Association of Hospital and Welfare Administrators, The Association of Supervisors of Midwives, the Royal College of Midwives, the Royal College of Nursing (RCN), the Scottish Health Visitors Association, the Scottish Matrons Association and the Women Public Health Officers Association – and four trade unions: the National Union of Public Employees (NUPE), the National Association of Local Government Officers, the Confederation of Health Service Employees (COHSE) and the General and Municipal Workers Union. This arrangement led to some confusing outcomes. Since the Royal College of Nursing was the largest single group on the council and often supported by other professional organisations like the Association of Hospital Matrons (matrons often dominated both organisations in the early NHS), they often led negotiations for staff. [*] However, since the RCN had (and has) a constitutional prohibition on strikes and largely frowned upon protest marches until the 1960s, COHSE and NUPE (the largest trade unions) were often the most visible faces of nurses’ discontent. 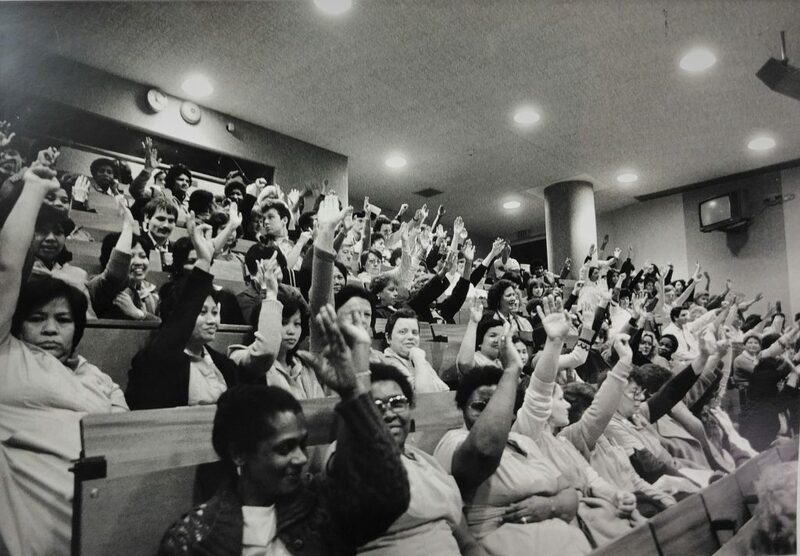 This division of representation between trade unions and professional organisations was replicated on every staff council except that of the ancillary workers, to which only the unions sent delegates. Over time amalgamations slightly reduced the number of organisations represented on these councils, but there were still 33 across all the different bodies in 1995. The RCN remained hugely important in representing nursing staff throughout the life of the Nurses and Midwives Whitley Council, which was largely superseded by an Independent Pay Review Board following protests in 1982. The new arrangement was based on a model established for doctors and dentists in 1952, where pay and conditions of service were decided independent of both staff and management by an independent board appointed to weigh up what was fair and, crucially, what would attract sufficient recruits to the profession. Although the new board was generally met with approval by nursing organisations, its work was often undermined by government interference. Ultimately, neither Whitley Councils nor Pay Review Boards offered direct representation to staff, with the former awarding delegates to organisations who were then free to choose who they wished to send. Only NUPE had a consistent track record of allowing its members to elect who would sit on the Council. Within the hospitals, health workers could try to wield some influence over their working lives through electing members to “joint consultative committees”. These were established in 1948 in an attempt to foster good relations and efficient working and consisted of elected representatives organised by category of staff, chosen by members of “representative bodies” (unions and professional organisations). However, unions in particular eventually came to complain that consultation was largely bypassed by hospital managers, who often only consulted staff after coming having made a firm decision. Research for the King’s Fund in 1968 concluded that Joint Consultation was largely a failure. “Some hospital authorities took the view that consultation had been foisted upon them from above.” Management reluctance meant little training for representatives, and doctors were able to bypass the consultation machinery by appealing directly to general hospital management. Even those things that committees did agree often took considerable time to implement, especially when they concerned staff welfare. At one hospital researchers found that recommendations on working conditions took on average 16 months to implement, as compared to 5 weeks for management mandates and 3 weeks for ideas relating to patient welfare. At most, the machinery simply never emerged or collapsed. By the late 1960s only 1 in 10 hospitals still had one and they were largely superseded by the recognition of shop stewards in the National Health Service in 1971. [*] The RCN was probably over-represented on the Nurses and Midwives Whitley Council – obtaining 12 delegates for approximately 46,000 members, only 26,000 of whom were dues-paying working nurses, whilst COHSE obtained just 4 for their 26,300 members. Such disparities probably reflected the superior political connections of the RCN in the Ministry of Health. Alex Mold, ‘Patient groups and the construction of the patient consumer in Britain: An historical overview’ in Journal of Social Policy, 39/4 (2010), 505-521. Stephen Williams and R.H. Fryer, Leadership and Democracy: The History of the National Union of Public Employees, Volume 2, 1928-1993 (Lawrence & Wishart, 2011).